Titan Comics: Doctor Who - THE ELEVENTH DOCTOR Year 2 #2 Review | Warped Factor - Words in the Key of Geek. Tony goes to the Daak Side. What sort of Who fan are you? Are you the sort that loves the punch-the-air, “Everybody lives!” finale? Or the sort who’s only happy if everybody’s dead? (Really, truly dead, I mean, not Moffat-Dead) Do you like a happy ending, or a deep, dark, pit of wallowing despair? 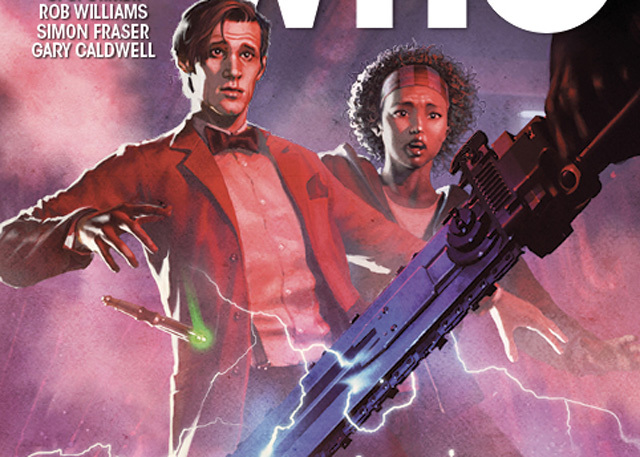 The Eleventh Doctor #2.2 has moments for everyone, but it skews towards those who like their Who on the dark side. Having introduced Abslom Daak, Dalek Killer into the mix at the end of the last issue, there was every chance things would get massively violent this time around, and so it proves – pitting the Dalek Killer against the complex space-time event that is The Then And The Now, which has been hired at phenomenal cost to kill the Doctor, proves…erm…interesting. Meanwhile there’s the business of The Squire, a companion of the War Doctor’s, who our Eleventh Doctor can’t remember, rocking the whole ‘man who forgets’ vibe till it squeaks in this issue from Si Spurrier and Rob Williams. If there are highlights here, Daak in action is undoubtedly one, giving a thrill to fans of his adventures way back in the day, particularly when we find out the answer to the question of what a Dalek Killer does when the Time War robs him of Daleks to kill. The explanation of what The Then And The Now is is another big highlight, partly because it takes the New Who idea of ‘fixed points in time’ and imagines what happens if you take a blowtorch to it (as, to be fair, the Twelfth Doctor seems intent on doing in Series 9 of the on-screen show). And a quick trip back in time to the creation of a thing called The Malignant, the scourge of The Overcast – the people who’ve brought the Eleventh Doctor in for sentencing after the War Doctor apparently destroyed their peaceful way of life, and created The Malignant in the first place – is a third. What becomes excitingly clear as this issue continues is that we’re not entirely sure how the story is going to pan out. Were we dealing exclusively with any of our known-quantity Doctors, we’d be sure that it was all a horrible mistake and that the Doctor couldn’t possibly be responsible for letting The Malignant loose. We’d be sure he was relatively innocent, undeserving of the fate to which The Overcast have condemned him. But we’re not dealing with any of those Doctors. We’re dealing with the actions of the War Doctor, who remains something of an unknown quantity. All we know about him really is that he was a version of the Doctor specifically chosen to fight the worst war in the history of the universe, and ultimately who took the decision to burn his own planet and people so that it would end. A version of the Doctor so arguably abhorrent that the New Who Doctors chose to disown him in their own memories, to bury him in the darkest parts of themselves, and to atone for what he did. We’re not at all sure what he might have done to The Overcast if he thought it would help to win The Time War, and neither, when it comes right down to it is the Doctor. All of this swirls around this issue and comes to a kind of head at the end – the kind of head that makes everyone want to sit around and tell sad stories, granted, but a kind of head nevertheless. But clearly, despite Titan labelling this as Part 2 of a two-part story, the story doesn’t in any way end here – it has the feeling of being the end of a 45-minute Part 1 of a series arc, of the kind the first year of Eleventh Doctor ServeYou Inc stories described. There’s nothing resolved at the end of this issue: Daak’s still aboard the Tardis, for all he’s gone off for a chuntery wander, the Squire is still on board too, and we’re not actually any closer to dealing with The Then And The Now or finding out what really happened to The Overcast, so clearly there’s more of this story to come, but the first act, the framing act, has been delivered. But for now, screw the future, Abslom Daak is back! To be honest, while the rest of the story is involving and interesting and gives you cause to pause and reflect about the Doctor’s responsibility in the universe, Abslom Daak is just one of ‘those’ characters – the kind who won’t let you look at or think about anything else whenever they’re in the scene. It’s a brave writing team that decides to bring him back, and while he has a perfectly legitimate place in this story, there’s an element of ‘stunt casting’ about his return that we absolutely approve of. He feels very much like he used to be, and should be, here, a kind of kickass space-age Conan the Barbarian, swinging his chainsword and leaping into action against…well, anybody really who gets in his way. 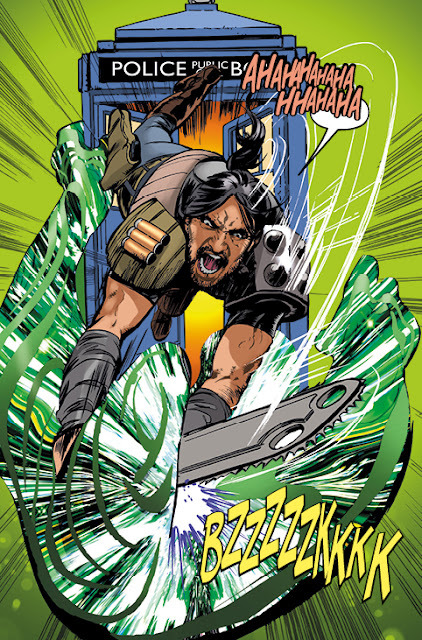 Daak being the risky proposition he is, it’s a mark of the collaborative energy between Spurrier, Williams and artist Simon Fraser that he comes to life exactly as you remember him here and doesn’t so much steal the show as hack its head off and strap it to his belt. Fraser’s artwork throughout this issue feels a little more loose and freewheeling than in the last, with less precision because there are fewer static moments – most of this issue is delivered through movement - but he’s by no means negligent in his duties. The standout ‘I’d love a poster of that’ image this time around is probably on Page 10, a semi-abstract piece with the Doctor explaining the nature of The Then And The Now. Although a Page 4 extravaganza of Daak and The Then And The Now in battle might yet steal that crown. Bottom line – Come to the Daak Side, we not only have cookies, we have a kickass comic-book with a rip-roaring return for one of fandom’s favourites, plenty of mysteries that as yet have no solutions, and a sombre note of uncertainty about just what the War Doctor was capable of, and how long the Doctors that follow him will be held accountable for his actions. 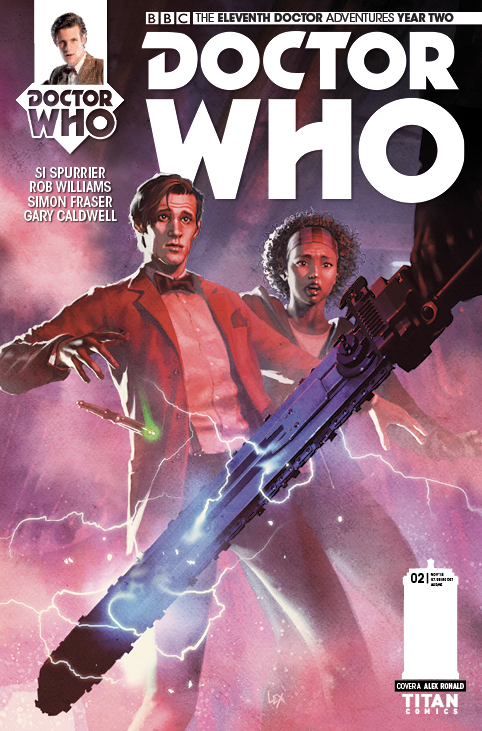 The Eleventh Doctor #2.2 is released Wednesday November 4th.